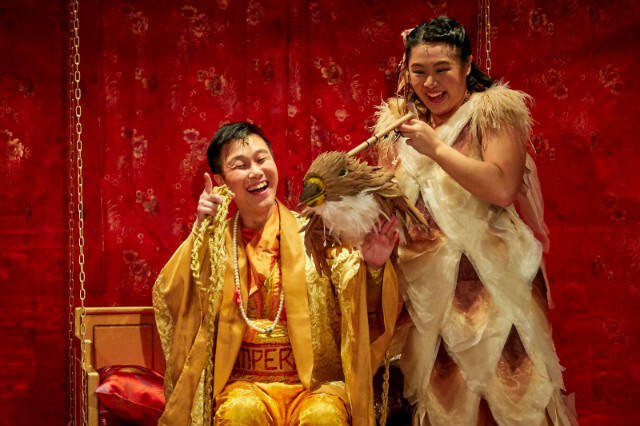 We caught The Nightingale by Singapore Repertory Theatre last weekend, and the kids had a really good time. The musical was funny, acting on point, and the songs were catchy and upbeat too. Based on Hans Christian Andersen’s classic fairytale, The Nightingale is a joyful burst of song that reminds us to appreciate and value the world around us. Enchanted by the lilting birdsong of the plain-looking, brown Nightingale, the Emperor of China captures and keeps her in a gilded cage for his daily entertainment. But soon, disenchanted at losing her freedom, the Nightingale stops singing and is replaced by a singing mechanical bird. Here are 4 important values the kids learned from the musical. 1. You cannot force people to do what they don’t want to do. The Emperor tried to force the nightingale to sing, and kept the bird in a cage. Only later does he learn that this wasn’t the best environment for the nightingale to thrive. The Emperor chased the nightingale away, angered by the fact that it would not sing for him. He could have tried to see things from the little bird’s perspective and seek to understand its needs, rather than just being focused on his own desire. When the mechanical bird that the Emperor receives from his cousin, the Emperor of Japan, breaks down, the Emperor starts to realise what he has lost. This parallels our world today where kids tend to value screen-time more than face-time, and raises the question: Can we really call a friend whom we interact with online a true friend? 4. You should not be afraid to try new things. 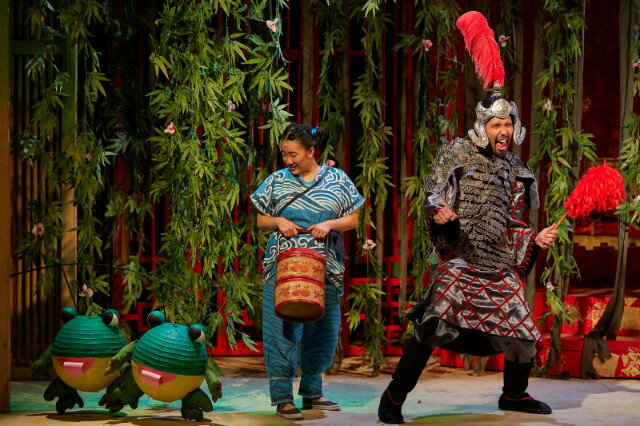 In the musical, the Emperor’s Protector was too good at doing his job of protecting the Emperor. The result: the Emperor was sheltered and ill-prepared to deal with the responsibilities of being a ruler. This last point may be relevant for parents as well. We all need to be reminded to allow our children some degree of freedom and choices as they grow, so as to enable them to learn through different experiences. The musical runs from 7 March till 20 April 2018. Get your tickets here before the show flies away! Vera and I were at a sneak peek at the Kids Performing Repertory Theatre last weekend. I’ve never been behind the scenes at any professional musical before, so it felt as if we had been ushered into a brand new world. Lots of kids in furry costumes. Here are the eager beavers. We also met a lion and a witch….Yes, it’s Narnia the Musical: The Lion, The Witch and the Wardrobe, based on the fictional masterpiece by C. S. Lewis. Narnia the Musical tells a wonderfully heartwarming tale of loyalty, bravery, repentance, and forgiveness. It was first staged in Singapore by Kids Performing in December 2009, with all 3 shows sold out then. Back by popular demand, this year’s production features singer-prodigy Julia Abueva, who will portray the White Witch, with an international cast of adults and children from Australia, England, USA, Japan, Philippines and Singapore. Here is “Aslan” (Vocal Director Terence Guillermo, in the orange hoodie) addressing the animal folks. Interestingly, the role of Aslan will be played by a female – Eirene Enriquez, with Terence as alternate actor. You know the story. The Pevensie children, Peter, Susan, Edmund and Lucy, stumble into the magical world of Narnia through a wardrobe. And they join forces with Aslan and his army of flora and fauna to battle the White Witch. Here is Peter, Susan, and Lucy, the little one who first discovered the wardrobe’s secret. Oh no, he got caught by the White Witch, here played by Eirene Enriquez. Here’s a sneak peek for you! Catch the White Witch, her minions, and Edmund in action. What better way to spend the upcoming holidays than in the magical world of Narnia?